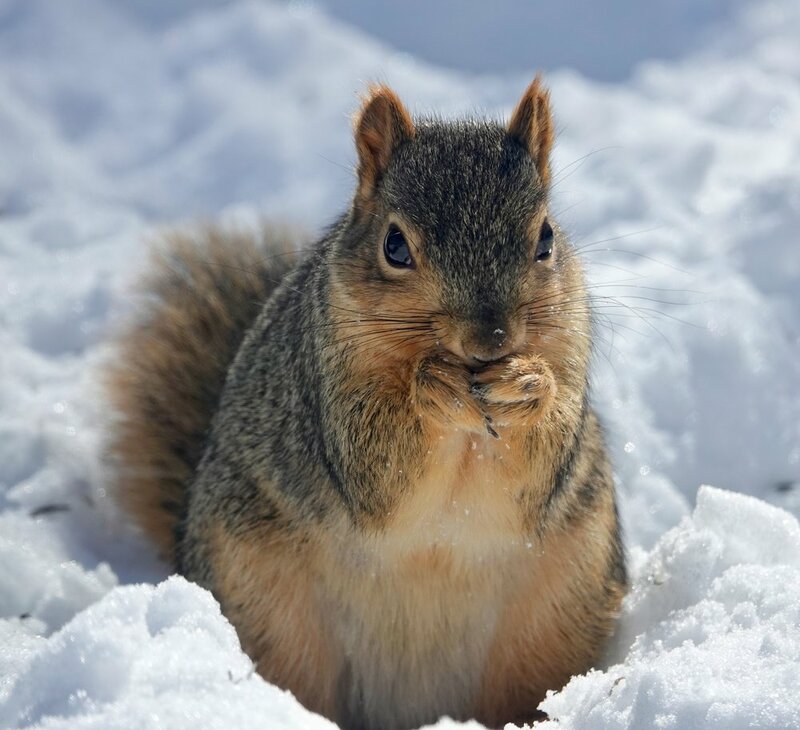 The yard’s weather squirrel. When it sits in snow, I can tell it has snowed. 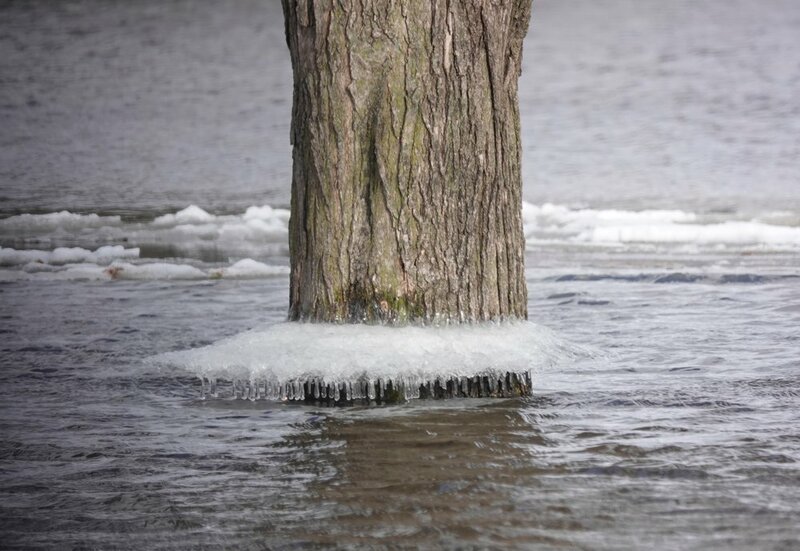 An ice/snow halo on a tree trunk shows the high-water mark. A blooming blue jay feather. 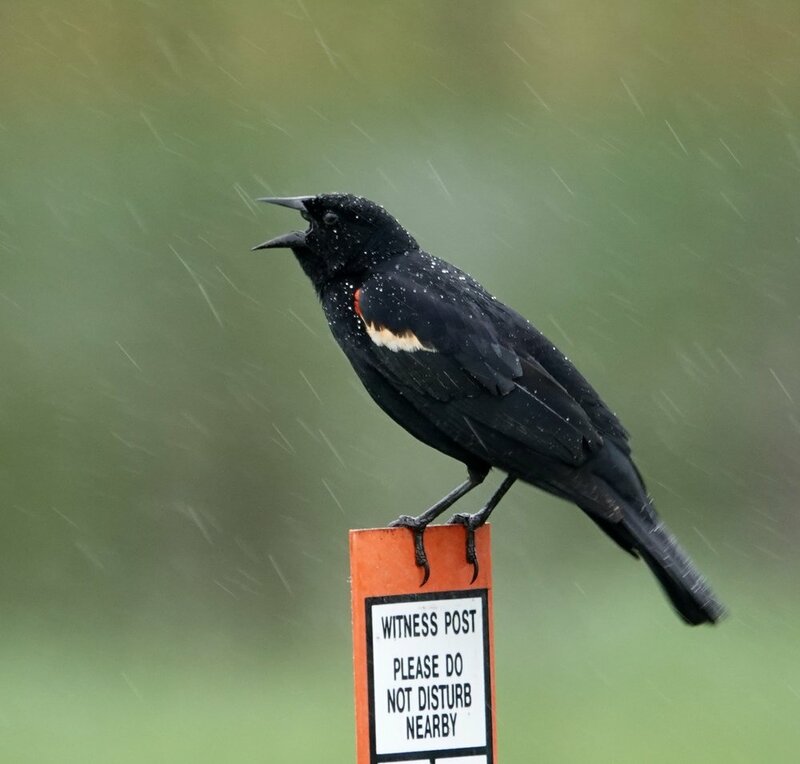 A red-winged blackbird singing in the rain. “How are you doing?“ I ask. 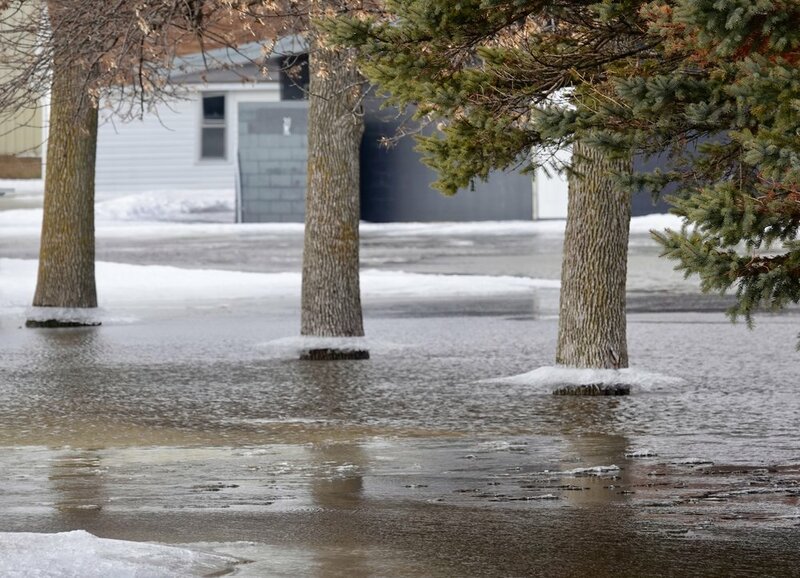 They could have just said, “Look out!” but the newspaper headlines blared that locals were bracing for another winter storm. Bracing meaning, I should have been preparing physically and/or mentally for something unpleasant. If I’m not ready by now, I’ll never be ready. There was more than enough snow to go around. Winter isn’t an easy companion. The citizens of the yard stay busy because they need to eat. Goldfinches generally become more common customers at the bird feeders during the second half of winter, as if inspired by a coach’s halftime talk. Juncos were trilling as if it were the next season. Horned larks, Lapland longspurs and snow buntings fed on roadsides. The darling of the yard and my minimum daily bird requirement, a chickadee, sang of spring. I stumbled outside into a day that was exactly my size. “Do robins eat sunflower seeds?” In the winter, some robins will eat sunflower hearts (hulled sunflower seeds) or chips (broken or semi-crushed seeds). “My brother used to call me a dodo when he thought I’d done something stupid. Why was that extinct bird considered stupid?” The dodo was discovered by Portuguese sailors in the 1500s on Mauritius, a small island in the Indian Ocean where the flightless bird had no natural predators and no fear of humans. The sailors incorrectly thought the lack of fear was a lack of intelligence, so they named the bird the dodo from the Portuguese doudou, which means simpleton. The dodo population dwindled as they were hunted for sport and food. Their eggs were eaten by the settlers’ pigs. In approximately 80 years, the dodo was extinct. “Why do owls cough up pellets?” Owls swallow small prey whole. The gizzard is a thick-walled organ that uses digestive fluids and grit to grind and dissolve all of the usable tissue from the prey. The types of tissue that can be dissolved by an owl’s digestive system include muscle, fat, skin and internal organs. Bones, teeth, feathers, fur and insect shells collect in the gizzard. The bird regurgitates the indigestible material as a pellet. “Where do birds go when there are strong winds?” Wherever the wind takes them. Different birds use different methods to wait out a storm. They seek shelter. Birds that normally roost in cavities — such as chickadees, small owls and woodpeckers — hide out in natural cavities or roost boxes. Many birds seek shelter on the lee sides of trees, along tree trunks or inside thick hedges or tangles. Some find their way into buildings. They hunker down. Birds are made to survive what nature throws at them.